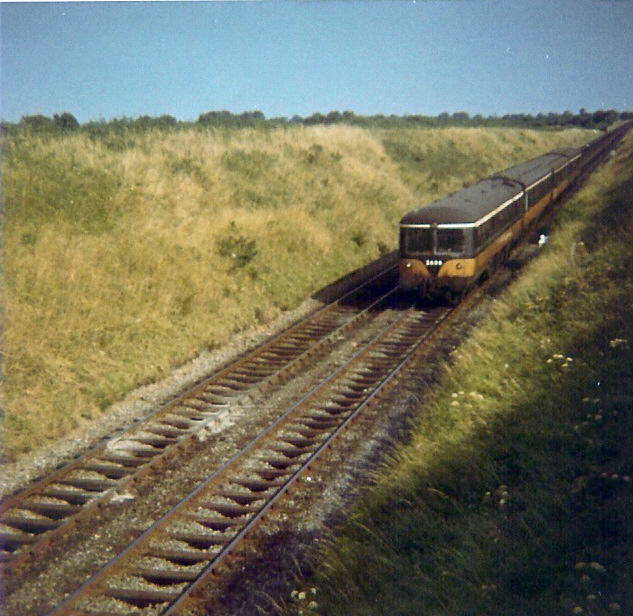 Ex-GNRI railcar set approaching Colp on Drogheda-bound train, the 15.15 from Connolly Station, Amiens Street, Dublin. These railcars, built by A.E.C. Ltd of Southall, were introduced onto GNRI lines in 1950 [[Link ]]. The small 1st Class section behind the cab afforded a view of the line ahead. In early 1970s all the plush seating, and the toilets, were taken out and replaced with the infamous plastic 'bucket seats' arranged in two lines at the sides, running the length of the cars. Grim times for commuters. This page has been viewed about 550 times.